In the previous post we looked more closely at routing in .NET Core MVC. There are two ways two declare the routing rules: imperatively via Startup.cs or declaratively in the controllers using attributes. The routing rules can be distributed with this solution. General routing rules like the Default route can be placed in Startup.cs, whereas controller and action method specific rules can be declared in the controllers directly. In this post we’ll continue building on our demo application. We’ll add a details page for the books and we’ll also see our first Razor HTML helper method in action. Before we move on with some other MVC related stuff let’s simulate that we’re extracting the list of books from a data store instead of a private function in BooksController.cs like it is now. It’s quite common that pure data store related actions are carried out by repositories. In our case there will be a Book repository. A repository is a normal C# class, there’s nothing special about it, but its role is very specific. The controller won’t normally communicate with a repository though. Instead there’s a layer in between which is called the service layer. The main responsibility of the service layer is to delegate the work necessary to retrieve the objects that the controller needs to other services and repositories. A service class is supposed to shield the complexities of working with the back end from the front end. We have not much complexity in our demo project yet. That’s in fact desirable so that we can go step by step without being sidetracked by a lot of new material. Also, services and repositories are normally placed in their respective C# library projects, but here we’ll keep everything within the web project. After all this course is about .NET Core and only marginally about software architecture. Our first objective is to refactor our code in BookController.cs so that it extracts the list of books from a Book repository via a Book service. …which is also located in the Domains folder. That should be easy to follow. 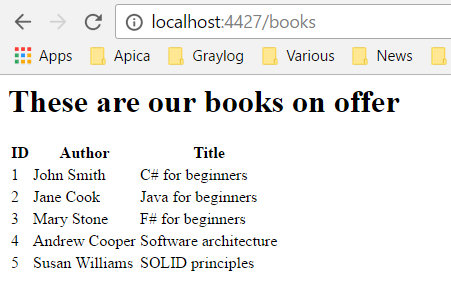 We build a list of books in the constructor and return them all in the GetAll function. That’s a very minimalist service implementation but again, we want to keep it simple. Our service class will delegate the database handling job to the repository. Run the application and navigate to /books. The same 5 books on offer should be listed in the screen as before, there should be no visible change for the end user. The good thing about this setup is that we can replace the implementation of these interfaces later on and the controller won’t care at all, it will continue to call the abstractions and ignore the concrete classes. Run the application and navigate to /books. You should see the updated header with the books count. The table should remain untouched. It inherits from the book view model so that those properties will also be available for the details view. Next we’ll add a link to each book view model on the books index page. The link will lead to details page of the book. Other overloads of ActionLink let us define the controller name if it’s different from the one the current page is using. We can also provide HTML attributes for the link such as a class name in an anonymous object. Click on it to come to the details page of the selected book. While on the details page you can also test an ID which doesn’t exist such as /books/details/20 to see how the default not-available-book is rendered. Whenever you’re not sure what kind of HTML Razor produces you can always look at the page source in the browser. We can now jump between the list of books and the details page of a selected book. View the next part here.